Hello and welcome to the final 2017 Frightful Fridays! I'm going out with a bang with the fireworks golem, which is made of fireworks and shoots fireworks. You might say it has a certain shtick. I hope you enjoy the fireworks golem, and your 2018 starts off great! Thanks for reading. I also invite you to check out my Patreon to help support the creation of these monsters. This collection of fireworks is shaped into a vaguely humanoid form. Sparks shoot randomly from the creature’s body, and a stray firework shoots from the mass at random intervals. Bright Light/Loud Bang (Ex) When a fireworks golem hits an opponent with its slam or firework attack, the foe must succeed on a DC 14 Fortitude save or become blind and deaf for 1 round. The save DC is Constitution-based and Includes a +2 racial bonus. Firework (Ex) A fireworks golem’s firework attack has a range of 60 feet with no range increment. Fireworks Explosion (Ex) If a fireworks golem is subject to at least 10 points of fire damage or if it is destroyed, it sets off dozens of fireworks. All creatures within a 20-foot burst take 2d4 points of bludgeoning damage and 2d4 points of fire damage; a DC 14 Reflex save halves the damage. On a failed Reflex save, a creature is blind and deaf for 1d4 rounds. The save DC is Constitution-based and Includes a +2 racial bonus. A fireworks golem that is still alive after its fireworks explosion ability is triggered cannot use its spell-like abilities and its attacks don’t deal fire damage or inflict its bright light/loud bang ability. This condition persists for 1d4+1 rounds. Immunity to Magic (Ex) A fireworks golem is immune to any spell or spell-like ability that allows spell resistance, with the exception of spells and spell-like abilities that have the cold descriptor, which affect it normally. In addition, certain spells and effects function differently against the creature, as noted below. · A magical attack that deals cold damage or produces water in the fireworks golem’s space slows it (as the slow spell) for 2d4 rounds, with no saving throw. · A magical attack that deals electricity damage breaks any slow effect on the golem and heals 1 point of damage for every 3 points of damage the attack would otherwise deal. If the amount of healing would cause the golem to exceed its full normal hit points, it gains any excess as temporary hit points. A fireworks golem gets no saving throw against electricity effects. Fireworks golems are automatons formed from fireworks and configured to look like a humanoid. Oftentimes, sparklers and other long-lasting fireworks form its eyes and its mouth. They shoot fireworks from their mass to defend themselves and have a limited suite of spell-like abilities based on their modestly explosive properties. Most of these golems are programmed to begin combat by using snapdragon fireworks and exhausting the fireworks from that spell-like ability while making single ranged or melee attacks. On occasion, wizards controlling fireworks golems will subject them to fireball (from a safe distance) to create a fantastic display. A fireworks golem stands 6 feet tall and weighs 250 pounds. 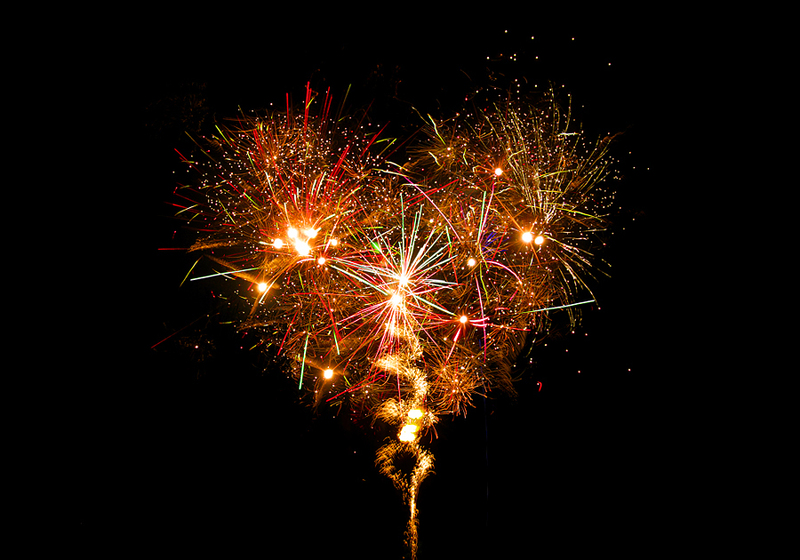 A fireworks golem’s body must be constructed using fireworks worth 400 gp. Howdy, and welcome back for another Frightful Fridays! I have moved on from plants to something else. This week's pair of creatures has no unifying theme (OK, they're both Small), but they are weird. First is the dropsplacer bear, a fun take on the drop bear. Next is the hydroseal, an adorable animal that shoots water. I hope you enjoy both of today's offerings, and I'll see you next week with another monster. Thanks for reading, and I hope you have a happy holiday week! 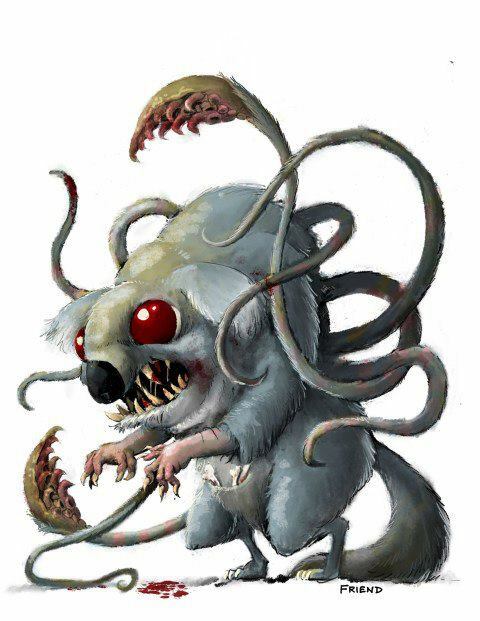 This koala bear has razor-sharp teeth and several tentacles sprouting from its back. Drop Charge (Ex) When dropping on opponents, a dropsplacer bear can effectively charge (gaining a +2 on attack rolls and taking a–2 penalty to AC). It can make a full attack when it lands. Dropsplacement (Su) When dropping from a height, a dropsplacer bear gains total concealment (50% miss chance). Additionally, it gains concealment (20% miss chance) for 1 round after it uses its dimension door spell-like ability. You're with Me (Su) If a dropsplacer bear has an opponent grappled, it can force that opponent to travel with it when it uses its dimension door spell-like ability. The grappled foe can attempt a DC 15 Will save to negate this ability. The save DC is Charisma-based. Dropsplacer bears are cruel creatures that delight in surprising prey that it falls upon and subsequently mauls. When they can’t situate themselves to effectively descend upon their opponents, they use their innate teleportation ability to land on their foes from a distance and attack. They also take advantage of this teleportation to grab victims and abscond with them to high locations, where they can attack their victims without interruption or just drop them from their perches. Dropsplacer bears in underground areas especially enjoy dropping their victims, since they can cling to horizontal surfaces with the sticky pads on their paws, while their prey usually cannot. Dropsplacer bears rarely work with other creatures, and often end temporary alliances by turning on their former allies. They even despise other dropsplacer bears, but they get around the necessity of meeting with other dropsplacer bears for mating purposes by budding, usually in a victim’s fresh corpse. A typical dropsplacer bear stands 3 feet tall and weighs 100 pounds. Water dribbles from this white-furred seal’s mouth. It observes its surrounding with immense curiosity. Hydraulic Burst (Ex) If a hydroseal strikes an opponent with its hydraulic burst, it gains a free bull rush or trip attempt against that foe; the seal gains a +4 racial bonus for the chosen combat maneuver. A hydroseal’s hydraulic burst has a range of 30 feet with no range increment. It does not incur attacks of opportunity when it uses this attack. A hydroseal can attack the same opponent it bites with its hydraulic blast. Oily Blubber (Ex) A hydroseal has extraordinarily oily blubber, granting it a +8 racial bonus to Escape Artist checks. Additionally, it has a 10% chance to negate critical hits or precision damage. Hydroseals resemble ordinary seals, and, at first glance, there is very little to distinguish them from ordinary seals. They are a little more precocious, though, and often indulge their curiosity, heedless of any danger they might expose themselves to. When something threatens them, they reveal their primary means of fighting back, as they unleash a powerful blast of water from a bladder they use to store water as they swim. 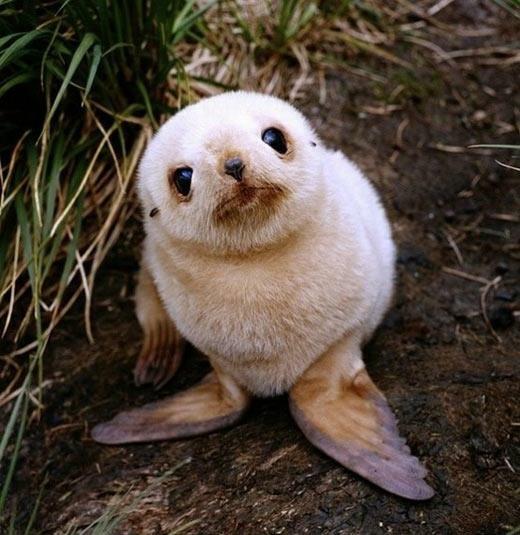 The water bludgeons the seals’ targets and allows them to repulse or knock down their targets. Hydroseals use this water jet to propel themselves in water to escape from more powerful predators. They also benefit from an extremely slick oil that permits them to slip out of a creature’s jaws or to turn aside potentially devastating strikes. Hydroseals adopt other seals into their pods for protection but turn out non-hydroseals during lean times when food becomes scarce. Because of the extraordinary speeds at which they can shoot through water, they often travel from location to location to find the best sources of food. Like their cousins, hydroseals are carnivorous and prefer fish. A typical hydroseal measures 3–1/2 feet in length and weighs 125 pounds. Starting Statistics: Size Small; Speed 10 ft., swim 60 ft.; AC +1 natural armor; Attack bite (1d4), hydraulic burst (1d6); Ability Scores Str 10, Dex 14, Con 15, Int 2, Wis 13, Cha 11; SQ low-light vision, oily blubber. 4th-Level Advancement: Attack bite (1d6), hydraulic burst (2d6); Ability Scores Str +2, Con +2; Special Attacks hydraulic burst (bull rush or trip attempt on successful hit). Hello, and welcome to another Frightful Fridays! This week presents a bounty of two terrible plants, the detonating bramble and the rotshroom. The detonating bramble shoots thorns into its victims and the thorns explode into brambles while inside their victims. Fun! 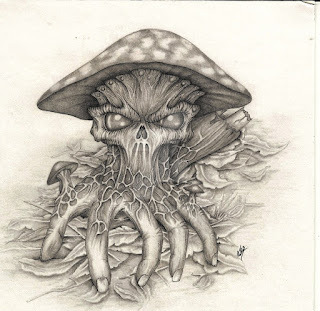 The rotshroom is more actively evil and likes to instantly decay its victims, which rise as zombies when they die. Also fun! I hope you enjoy both of these monsters. I'll see you next week with another monster! This gnarled and twisted collection of plant matter sports long, sharp thorns that look like they could break away easily. Broken Thorn (Ex) A detonating bramble must break off a thorn when it uses it as a ranged weapon, and may break off a thorn when it makes a successful melee attack with a thorn. This deals 1d4 points of damage to detonating bramble. On a successful hit with a thorn, the bramble gains a free combat maneuver check with a +4 racial bonus to impale the thorn in the foe it struck. Removing one thorn requires a DC 20 Heal check made as a full-round action. For every 5 by which the check is exceeded, one additional thorn can be removed. On a failed check, a thorn is removed, but the process deals 1d6+2 points of damage to the victim. A thrown thorn has a 10-foot range increment. Detonating Thorn (Ex) A broken thorn explodes into an inert bramble after 1d4 rounds. This deals 6d6 points of piercing damage to the victim (DC 21 Fortitude halves). The victim is entangled and nauseated until the bramble is removed, requiring a DC 21 Heal check made as a full-round action. On a failed check, the bramble remains, and the victim takes 2d6 points of damage. The DCs are Constitution-based. Kindling (Ex) Upon taking fire damage, a detonating bramble gains vulnerability to fire. If it fails its Reflex save against an attack that requires a save and deals fire damage, it catches fire, taking 1d6 points of fire damage each round, but its melee attacks add 1d6 points of fire damage. It can attempt a Reflex save (at the same DC as the original Reflex save) as a full-round action to put itself out; the bramble has a +4 racial bonus on this save. Thorn Defense (Ex) Any creature that strikes a detonating bramble with a non-reach melee weapon, unarmed strike, or natural weapon takes 1d6+2 points of piercing damage from the bramble’s thorns. The bramble can use its broken thorn ability to lodge a thorn into its opponent. Verdant Healing (Ex) While in undergrowth, a detonating bramble gains fast healing 2. Created by fey druids, detonating brambles are a blight on living, fleshy creatures making the mistake of entering their lairs. While possessing more of an instinctual level of intelligence, the brambles are patient enough to wait for their victims to draw close enough for them to attack from a position of advantage within the undergrowth where they hide. Detonating brambles gather up loose plant material from undergrowth, which allows them to heal from the damage they inflict upon themselves to leave thorn within their victims. These thorns become terrible time bombs that burst into a full-grown bramble while devastating their hosts. These new brambles are inert, initially, but become new detonating brambles if left to grow in the gory remains of their victims. Evil druids cultivate detonating brambles as guardians, but they must use magic to control the brambles, since the creatures are too dim to recognize them as allies. A typical detonating bramble has a 4-foot radius and weighs 20 pounds. This pale mushroom has a seam down its stalk giving it a pair of legs. It oozes a tarry substance from its cap, and a pungent odor emanates from the tar. 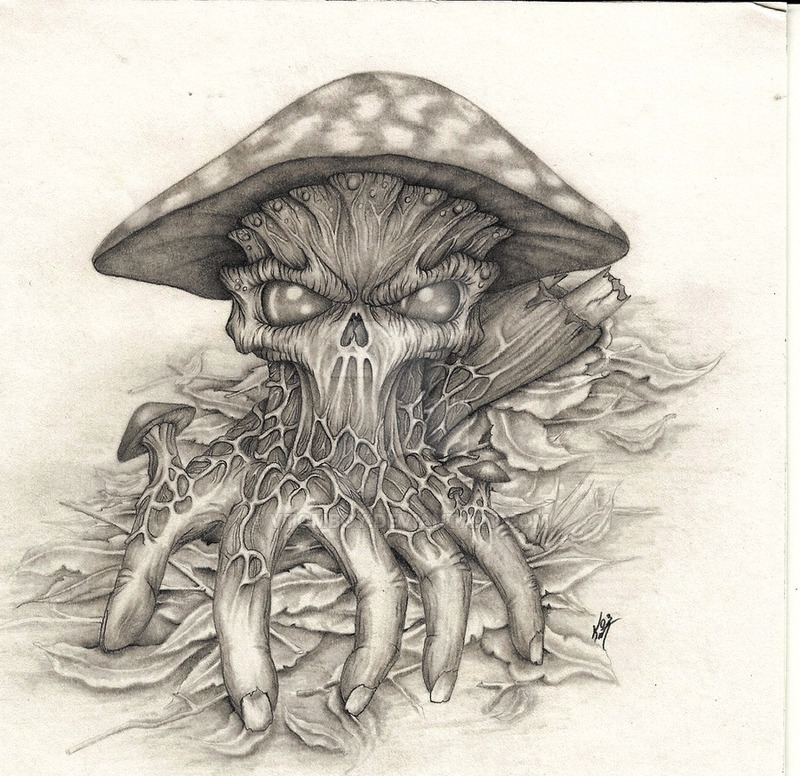 Create Spawn (Ex) A living creature that dies as a result of a rotshroom’s spores rises as a free-willed fast zombie with the rotshoom’s rot spores special attack 1d4 rounds later. Spore Cloud (Ex) Once every 1d6 rounds, a rotshroom can release a 20-foot-radius cloud of spores. All creatures caught within the cloud are subject to the rotshroom’s spores and must attempt a DC 18 Fortitude save. On a failure, the victim becomes sickened for 1d4 rounds; if it is already sickened as a result of a previous use of the rotshroom’s spore cloud or its stench, the victim instead becomes nauseated for 1d4 rounds. The save DC is Constitution-based. Spores (Ex) Any creature that takes damage from a rotshroom’s tentacle attack or is caught in the rotshroom’s spore cloud becomes exposed to its spores. These spores grow rapidly in living creatures. This affliction is a disease effect, but it is poison-like in its speed and duration. Rot Spores: Disease—injury or ingested; save Fort DC 18; frequency 1/round for 8 rounds; effect 1d4 Con damage and 2d4 bleed, and the victim must succeed on an additional Fortitude save or 1 point of Con damage becomes 1 point of Con drain instead; cure 2 consecutive saves. Rotshrooms thrive in areas where dead bodies have been left to decay. They accelerate rot, so they can more readily feed on it. Their predilection for open grave sites and other places where large numbers of creatures died gives them a kind of necromantic ability, and living creatures that succumb to the rot they inflict come back as shambling undead. This ability makes them attractive to powerful undead and necromancers, since the plants do the work of revivifying bodies, leaving the newly created zombies available for control by these powerful creatures. The plants also serve as a line of defense for undead creatures and frustrate enemies who come prepared to destroy undead, but may be surprised by living allies capable of incapacitating their foes with their virulent rotting disease and disgusting odor. A typical rotshroom stands 3–1/2 tall and weighs 50 pounds. Hello and welcome back to another installment of Frightful Fridays! I know I gave you plants last week, but the forest linnorm is on the opposite end of the power scale, plus it's technically a dragon. I thought it would be fun to design a less overtly threatening linnorm, but it will react to threats just as nastily as any of its obviously evil cousins. I hope you enjoy the forest linnorm. See you next week with another monster! It's treesed to meet you! 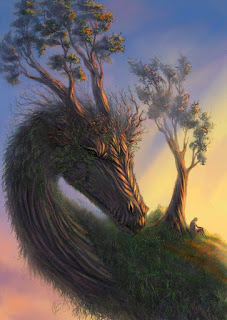 Several trees grow from this dragonlike creature, creating horns sprouting from its forehead and a row of spines down its back. Breath Weapon (Su) Once every 1d4 rounds as a standard action, a forest linnorm can expel a 60-foot cone of electrified, grasping vines, dealing 20d8 points of electricity damage to all creatures struck (Reflex DC 29 for half). Creatures that fail their saves are immobilized in the vines, while creatures that save are entangled. The vines remain for 1d4 rounds, filling the cone-shaped area, before withering. Any creature that ends its turn in the vines take 4d6 points of electricity damage (no save). The save DC is Constitution-based. Death Curse (Su) Curse of Forest’s Foe: save Will DC 29; effect the creature is treated as entangled when it is in forest terrain, the creature takes a –10 penalty on Survival skill checks and all physical skill checks within a forest, and all plants have an initial attitude of hostile toward the creature, gain a +2 bonus on attack rolls against the creature, and their attacks deal an extra 2d6 points of damage to the creature. Plantspeech (Ex) A forest linnorm has the ability to converse with plants as if subject to a continual speak with plants spell. Most plants greet the linnorm with an attitude of friendly or helpful. Poison (Ex) Bite—injury; save Fort DC 29; frequency 1/round for 10 rounds; effect 4d6 electricity damage and 1d6 Str drain; cure 2 consecutive saves. Forest linnorms are a species of so-called southern linnorms, which are decidedly less harsh than their cousins to the north in reflection of the gentler nature of their territory. This does not mean forest linnorms are immediately friendly to trespassers, but they generally prefer to converse before attacking. However, creatures that harm the forest the linnorms call home receive their immediate wrath. The draconic creatures provide homes to animals, a variety of plants (sentient and non-sentient), and fey. When at rest, forest linnorms look like a copse of trees and incidentally provide shade and shelter for visitors to their sizable mass. Provided these visitors do no harm to the trees making up the linnorm’s body, it is possible the visitors may never realize they encountered a living creature. Forest linnorms shed seeds from the trees comprising their bodies to regrow forests which have been devastated by natural catastrophes or destruction wrought by humanoids. A forest linnorm is 55 feet long and weighs about 12,000 pounds. Hello and welcome back for another installment of Frightful Fridays! This week you're getting leshys, because everyone needs more leshys. You can put these in your Yuletide-themed games or pretty much anywhere else where you've got a forest. Go crazy! I hope you enjoy these leshys, and I'll see you next week with something else. Thanks for reading! Bright red berries grow in clusters on this plant resembling a humanoid. Its razor-sharp leaves contrast with the berries’ cheerful appearance. Holly Berries (Ex) A holly leshy begins combat with 4 berries with healing properties. It can consume a berry as a move action, which heals it 1d4 hit points. The leshy replenishes its berries at a rate of 1 berry per 6 hours; it can have no more than 4 berries at a time. Sharp Leaves (Ex) A holly leshy’s leaves are painfully sharp, increasing its critical threat range with its slam attack to 19–20 and allowing it to inflict 1d2 points of bleed damage on a successful strike. Additionally, when a creature grapples a holly leshy or successfully hits it with an unarmed attack or natural attack, the creature must succeed on a DC 15 Reflex save or take 1d6 points of damage. The save DC is Constitution-based. Holly leshys have a dichotomous nature, acting as a bloodthirsty warrior and simultaneously as a caring healer. Among plants and creatures they are sworn to protect, the leshys are generally kind and helpful, but they have short tempers and often storm off in a huff when something bothers them. This lasts for a few minutes before they return, very apologetic for the outburst. When something threatens their home, though, they fly into action and slice up their opponents, giving them no quarter. This ferociousness makes it difficult for allies other than holly leshys to get the leshys to leave survivors. This also makes it difficult for them to remain still and wait for enemies to approach so they can attack them with the element of surprise. Holly leshy impetuousness sometimes exasperates lotus leshys with which they share homes. A typical holly leshy grows to 2 feet in height and weighs 15 pounds. A holly leshy can grow in any forested area. It must receive at least one drop of blood and a berry from a goodberry spell to grow. This softly nettled plant is shaped like a somewhat pear-shaped humanoid. Several pine cone droop from its limbs. Pine Cone (Ex) A pine leshy’s pine cone has a range increment of 30 feet. Pine Sap (Ex) A pine leshy gains a +2 racial bonus to its CMB for disarm attempts. Additionally, it takes a –2 penalty to its CMD to resist grapple attempts, but it receives a +2 racial bonus to its CMD against attempts to break free of its grapple. Shower of Cones (Ex) Once per day, a pine leshy can take a standard action, without incurring attacks of opportunity, to violently shake off several pine cones. This deals 2d6 bludgeoning damage to every creature adjacent to the leshy (DC 17 Reflex halves). 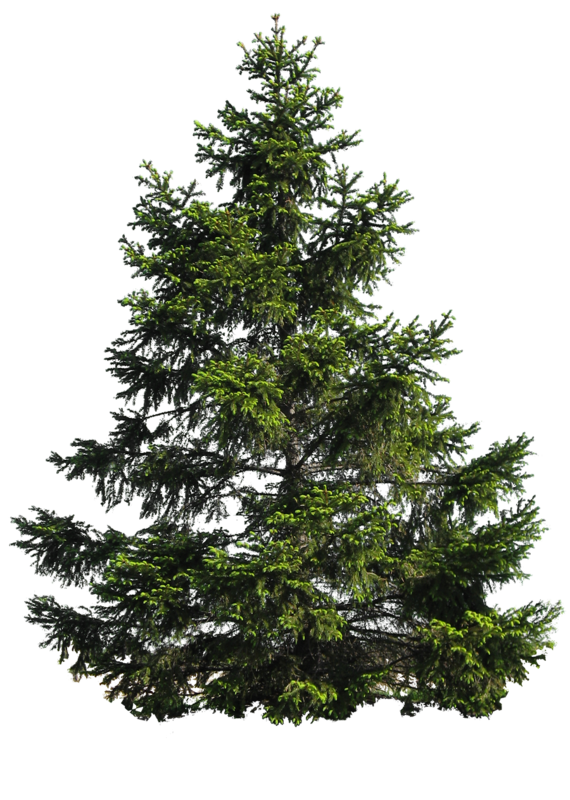 Pine leshys are one of the largest known species of leshy, but they are typically gentle giants. They can thrive in almost any environment, but they prefer colder climates where they can provide protection to less adaptable plants and animals. They are slow to provoke to anger, but antagonizing them to that point unleashes a series of unrelenting nettle-filled smacks. If they aren’t incited to attack, they attempt to defuse a combat by grabbing hold of the most troublesome participant or interposing themselves between opponents. During downtime, pine leshys are very kind and spend much of their time listening to other plants’ concerns. The leshys offer warm embraces to creatures which accept them and suggestions for issues regarding those they view as friends. Pine leshys often travel to humanoid settlements to extend friendship and take care of the plants and animals living there. 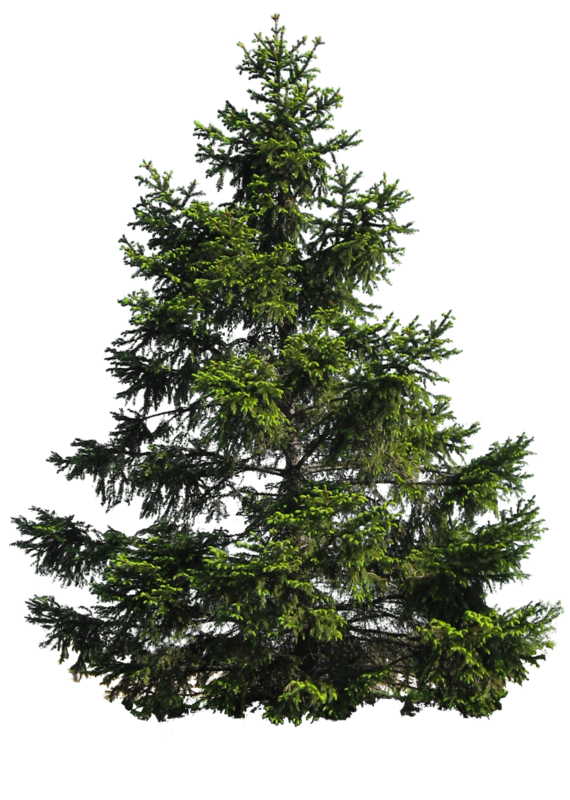 A typical pine leshy is 5–1/2 feet tall and weighs 100 pounds. 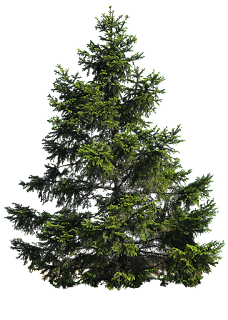 A pine leshy grows best among other conifers. It must be coated in fresh pine needles to ensure its growth.